Closing the car door, I realised I was giving off a fairly strong smell of pig. It's not a bad smell, but it is fairly distinctive; earthy with an overtone of muddy straw. Fortunately Vicki was probably similarly aromatic. 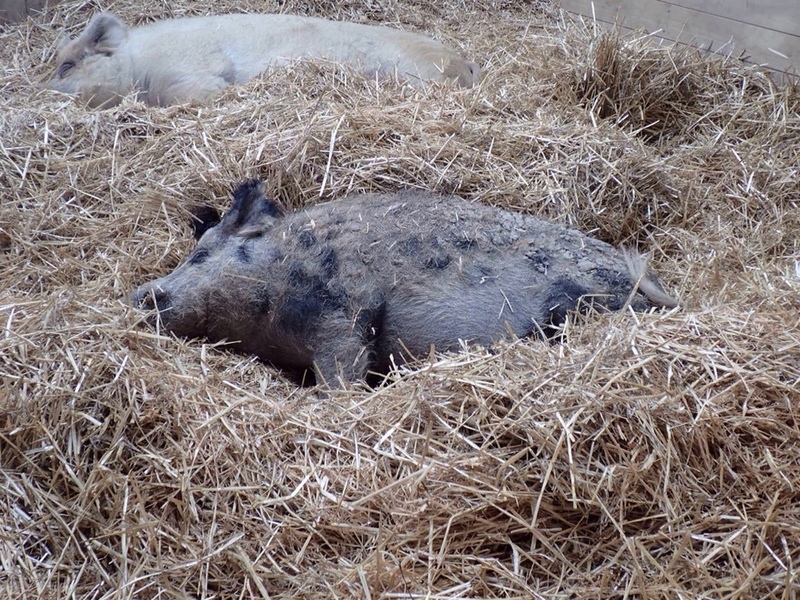 Anyway, she didn't seem to mind, and after all it was she who had organised our trip to Edgar's Mission and a spot of pig cuddling. 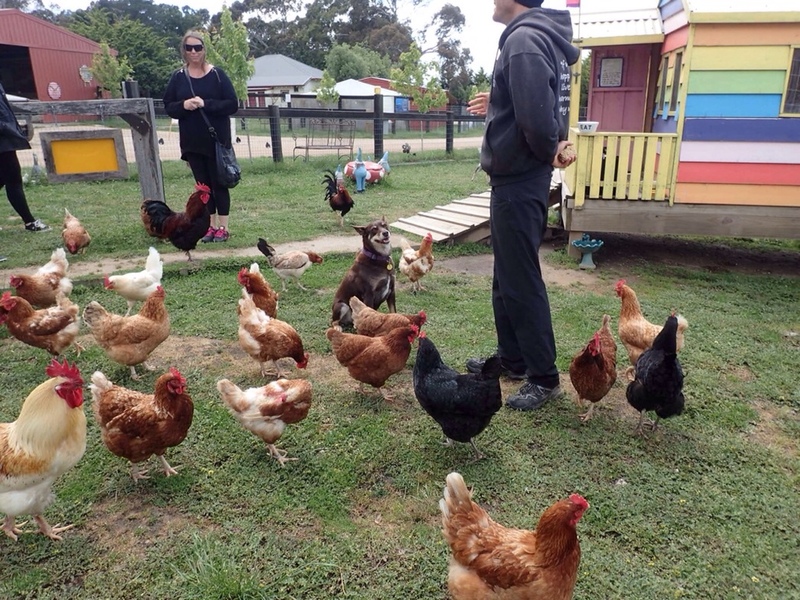 Not only cuddlesome pigs, but a gorgeous dog called Ruby who was sent to be shot because she was a failure as a farm dog, hopeless at herding stock, and far keener to interact with humans. Do you feel a bit of a theme developing here? Last week Gem/Jem, now Ruby. Though the first would be my childhood's black Labrador Tessa, the gun dog who wouldn't retrieve, whose days were at one point similarly numbered. Decadently sipping red wine in my pyjamas while I wait for the washing to finish downstairs. I think we have at last reached the tipping point in Aunt's flat where there is now at last less to clear than has been cleared. I was helped today by two friends. They met Mother and Aunt years ago, there's an NI connection, and that was that. Part of the family now. They dropped by before lunch, went away, obviously thought about the task and called to offer their services this afternoon. Five hours later I told them they needed to go home for their dinner. But what a difference it makes having three pairs of hands, three pairs of legs, three pairs of eyes. Were you to walk into the room where I am sitting now, you might think my excitement rather premature, but bags and bags of stuff have gone to the recycling, the charity shop, the rubbish, and the chemist. We have reunited separated parts of a food processor, found pictures of Aunt that made us stop and reminisce. There's a letter, a testimonial written for Aunt by her first employer that she had promised to look out for me. Definitely one for the family archives. 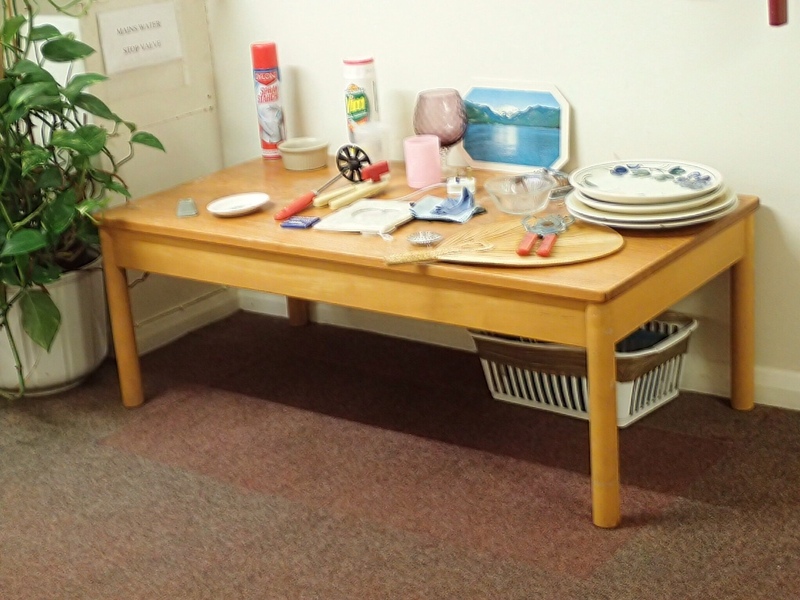 At the scheme there is a table opposite the laundry room where people can leave bits and pieces they no longer want for other residents to take. I have been putting cleaning materials there, coffee sachets, a tin opener, an egg slicer. You get the picture. Often when I visited Aunt I would bring magazines and leave them there. They always went really quickly. Aunt and I would wonder who took them and why. Yesterday I left two full bottles of carpet cleaner there went put to the car came back and the carpet cleaner had gone. This morning I was playing with MasterB and thinking I should call Aunt. These are the hiccough moments. Since she has been too weak to attend her church I have often called her on a Sunday morning. Later in the day I am competing with visitors and the daily ‘phone call with Uncle Bill. So, a bit of adjustment. MasterB of course doesn’t know she is dead, but he did know Aunt who loved him. He was very relaxed and trusting with her. 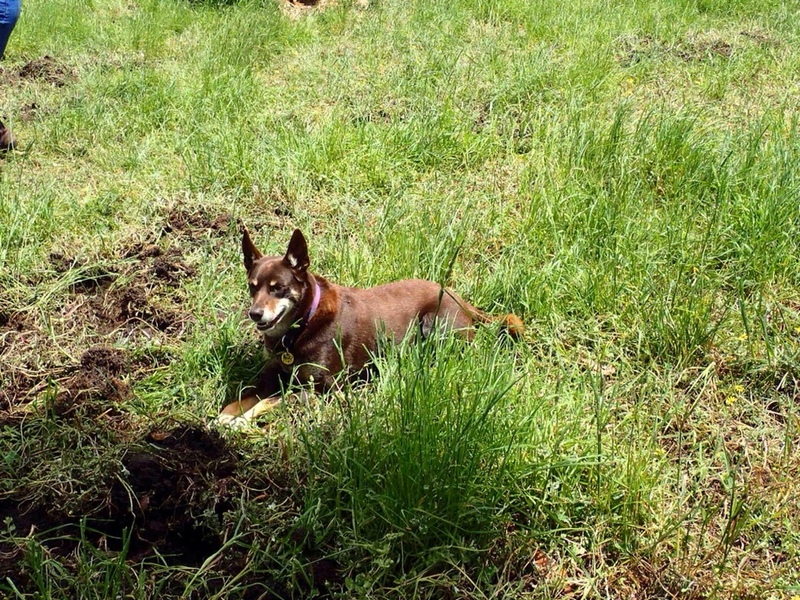 They met shortly after I got him, and each time he saw her after that he wound himself about her, rubbing his face against her, and making himself at home in her home. Given the main purpose of the journey was see the dentist, you might not think it was that good a day. Celia had said she’d come to Guildford with me. I only learned later that her main experience of it prior to yesterday had been the one way system, a system which has probably caused more mental anguish and geographical confusion than is fair. It’s a quick journey from Waterloo, and soon we were walking through the town. For those of you unfamiliar with Guildford, hills feature quite strongly. 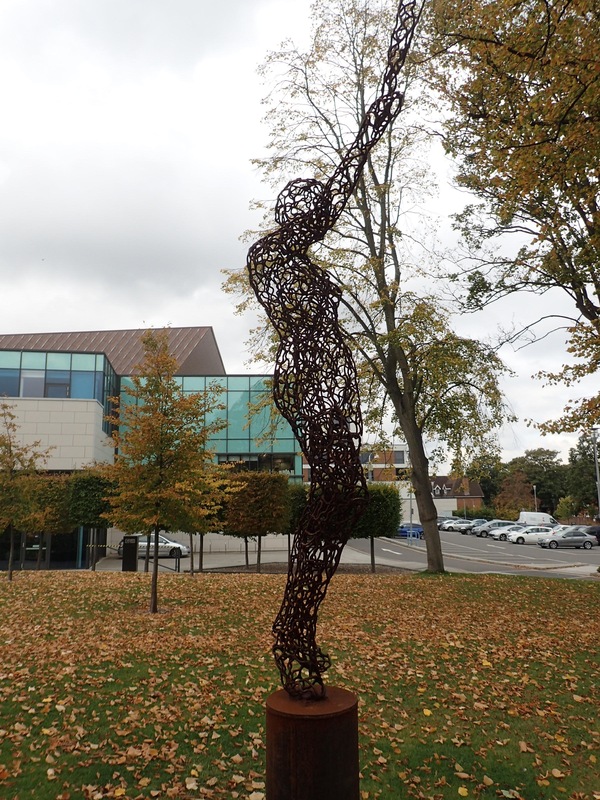 The railway station is at the bottom of the town, near the river, and my dentist is at the top, not far from a rather lovely sculpture recalling the Olympic Torch Relay. This is the post I wanted to put up last night when the media part of WordPress was throwing me blanks when I tried to upload photographs. It’s not quite right today either, but I think I have succeeded this time. Some of you may recall that when Cat died, and I tried to register with various charities agaisnst the day when I should be ready to welcome a new feline into my home, a prominent cat rescue organisation turned me down when I explained that my cat came with me to das Boot. I was told there was no way any of their cats could be rehomed with me; that such behaviour on my part rendered me completely unsuitable to be in charge of a cat. It was just two weeks after Cat’s sudden death. I felt like a murderess, a cat abuser, someone who committed acts of unspeakable cruelty against her pet. I knew Cat had been happy afloat. The vet was very proud to having a boating cat on her books and told people about him. Still, the words stung, and sowed a seed of doubt. Was I being unfair? 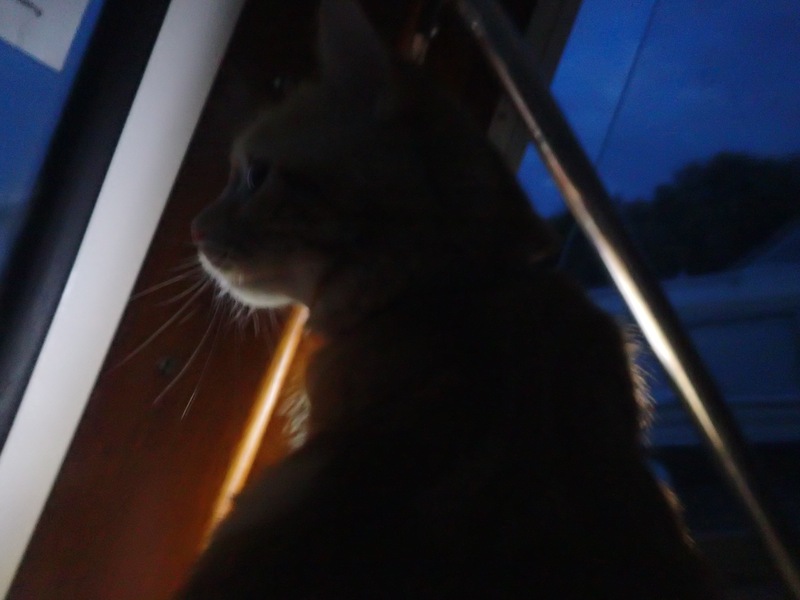 How could a cat enjoy being confined to a smallish boat when he was used to enjoying the freedoms of a largish garden? Though another charity was ready to confine any adoption by me to that of an indoor cat as I live on the second floor, and there is no catflap. I may be kidding myself, but I think MasterB, like Cat before him, is fine on das Boot. He wouldn’t like to live aboard always, but then neither should I. However, there are compensations. 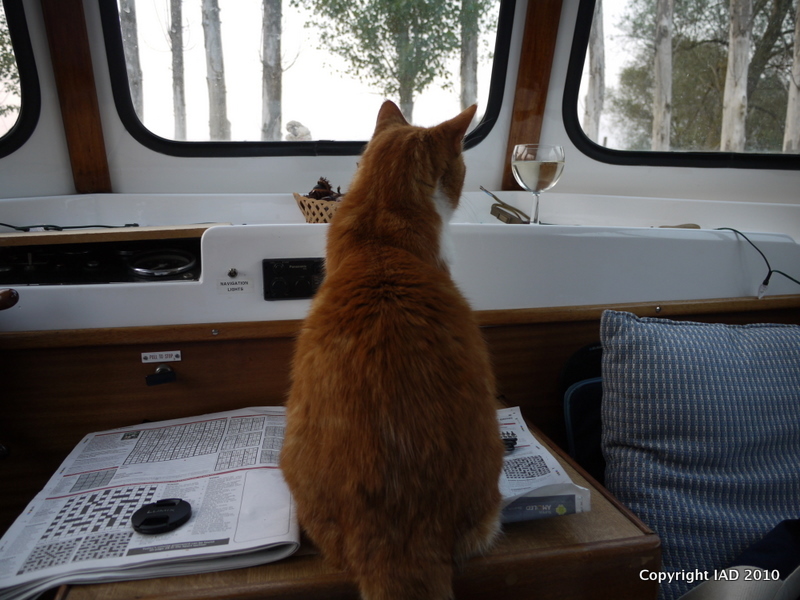 Just like Cat, he enjoys watching the fish, fowl and fauna from the boat’s windows, and sometimes from the gunwale. On Thursday evening, I sat in the dark so he could enjoy the view. I read a post by JanH about Christmas that chimed with me. Rather than paraphrase or summarise it, I’ll give you the link here. Cutting back does not mean a sad and miserable yule. Take away those ghastly hours in overheated shops looking for gifts you do not have any confidence the recipient will actually like, and suddenly you have time for the fun side of the jolly season. With me at the Nine Lessons and Carols at St Bart’s the Great on Tuesday were my blogging pal TBM and some friends who are also neighbours. Crystal means clear, running streams; elegant cut glass; New Age hippies divining auras; that Turner Prize winning artist whose name I have forgot who grew bright blue crystals in a council flat that was due for demolition; MasterB having problems peeing. My feline pee collection technique, a skill I look forward to adding to my CV, will be used again in a few weeks. The results from the last sample have revealed crystals in MasterB’s urine. Lots of crystals. Not the sort anyone is going to use to advertise the clarity of water or wave over you to heal minor illnesses. Hopefully a change of diet to a special food will dissolve those crystals and allow him to pee easily again. He’ll start it next week and be on it for at least a month. Then it’s pee collection time again, another test, and we’ll take it from there. Yesterday, realising we were close by the cattery, Octavia and I sent a text message to ask if we could drop in and see Trevor. The answer was yes. He had just enjoyed his first day of freedom in the garden, enjoying the sunshine and mingling comfortably with the other cats, pinning one who had offended him to the ground under a bush, and retreating for a nap from time to time in his own house space. Someone came to see him last week, liked him, but has not offered him a home. Which means, if you are quick, this glossily healthy boy could be yours. A Cat Called Trevor Update: So Handsome! I am about to dash off to Octavia’s for some chat and to see her her mother, who is visiting. However, I had to post this first. Just look at how healthy and handsome Trevor is now.What a warm and fuzzy moment just looking at his picture.